Legal decision makers tag only 90 firms as sure long-term survivors and true leaders in The BTI Consulting Group’s newest research. Adaptable, aggressive, forward looking, intuitive, and realistic - these are the traits attributed to the law firms best positioned to be future market leaders. 90 law firms are earning recognition as best bets to be long-term survivors—an uptick of 45% from 2014—as revealed in the just-released BTI Brand Elite 2015: Client Perceptions of the Best-Branded Law Firms. The BTI Consulting Group’s newest in-depth research with 648 corporate counsel at Fortune 1000 and large organizations reveals the 90 law firms with the biggest imprint on corporate counsel in one of the key brand differentiators: long-term market leadership. In what can only be a sign of confidence and optimism, corporate counsel recognize substantially more law firms as successfully navigating market shifts to emerge as long-term leaders. This rise in potential market leaders has a strong impact on hiring for large and potentially long-term assignments, i.e., big ticket litigation. No corporate counsel wants to even consider a law firm for long-term work if they sense their firm will not be a strong player in the future. A selection of firms new to the list of Long-Term Market Leaders this year includes: Akin Gump Strauss Hauer & Feld, Arnold & Porter, BakerHostetler, Bryan Cave, Dechert, Faegre Baker Daniels, Fish & Richardson, Fisher & Phillips, Foley & Lardner, Haynes and Boone, Holland & Knight, Orrick, Herrington & Sutcliffe, Shearman & Sterling, Sutherland, and Vinson & Elkins. BTI conducted 648 independent, individual interviews with CLOs, General Counsel and legal decision makers at Fortune 1000 companies and large organizations. Now in its 15th year, BTI conducts the only continuous benchmarking market study of corporate counsel worldwide. 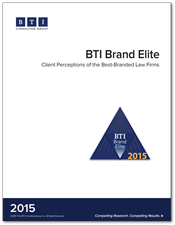 The complete list of The BTI Brand Elite 26 and details on the brand performance of 450 law firms are available in BTI’s new report, The BTI Brand Elite 2015: Client Perceptions of the Best-Branded Law Firms. Find more information about this and other compelling research at http://www.bticonsulting.com or contact BTI at 617.439.0333. BTI is the undisputed leader in providing high-impact strategic client research to professional services firms and their clients.